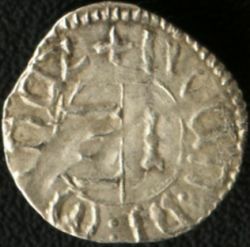 On the previous and next pages you will find a few other fakes manufactured in the same manner as this supposedly ducat from Mircea the Old of Walachia. The sides were independently created through galvanoplasty and then forced together (with real craftsmanship). Usually, this method allows for a black, separating surface between the two sides to be noticed. In this case though the edge is perfect. It was't necessary to be filed on the edge in order to hide matching imperfections, making these forgeries more harmful. The Bible of Romanian numismatics, Monede şi bancnote româneşti by George Buzdugan, Octavian Luchian and Constantin Oprescu (1976), is not aware of this variant. The coin we host resembles number 99 (for the legend) and number 102 (for the ensigns) the most, but we couldn't find an exact match. It's very likely that this coin was first claimed as unknown up to now by us and thus discovered by Romanian coins. It is not that hard to believe this statement since many medieval Romanian coins (issued by Moldavia and Walachia especially) are known in one or but few pieces and new types are discovered even today. 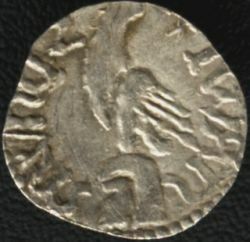 It is fit in the ending to point that, with one little exception of poor quality, this and the coin on the next page are the only two Walachian coins available on the entire net. Help from other collectors is more than needed. Do not hesitate to contact us.